NOJA Power has recently been awarded a contract from Thiess-John Holland Joint Venture to supply low voltage switchgear for the Airport Link and Northern Busway projects. The $4.8 billion project, including the Airport Roundabout Upgrade, is currently Brisbane’s most significant upgrade to its transport infrastructure. The Thiess-John Holland Joint Venture is building the Airport Link 6.7 km toll road, which is mainly underground, connecting the Clem 7 Tunnel, Inner City Bypass and local road network at Bowen Hills, to the northern arterials of Gympie Road and Stafford Road at Kedron, Sandgate Road and the East West arterial leading to the airport. In addition, Thiess-John Holland is building Stage 2 of the Northern Busway from Windsor to Kedron, a two-lane, two way road for buses, connecting the Royal Brisbane & Women’s Hospital to Kedron via the Lutwyche Road and Gympie Road corridor. The Tunnel will boast a variety of cutting edge, redundant electronic systems such as automatic traffic incident detection, ventilation control, air quality monitoring, CCTV monitoring, thermal detection and fire safety systems, directional signs, and an electronic tolling system providing national compatibility. 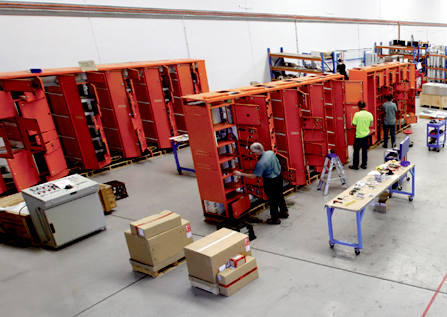 These systems require high quality and reliable switchgear to provide for continual and uninterrupted operation which will be manufactured and tested in the NOJA Power Factory in Murarrie, Brisbane Australia. NOJA Power Switchgear Pty Ltd will be supplying approximately 500 switchboards for this project.